If you want to hatch turkey eggs you can buy different kinds of turkey eggs from hatcheries across the country. Since the eggs are shipped to potential owners, the hatcheries do not guarantee hatchability of the eggs. But they do ensure the delivery of fresh eggs in mint condition and any broken eggs are promptly replaced. It will take around one week to ten days to get the turkey eggs delivered to you. You can order the eggs by the dozen and these are shipped through April and all the way through June. Since all the eggs are insured you can have any broken eggs replaced. You can select from among Bourbon Red, Blue or Slate turkey eggs, Beltsville turkey eggs or the beautiful Black Spanish turkey egg. If you are interested in hatching the traditional wild turkey then you should get the Eastern variety. Another unique turkey egg available at different turkey hatcheries is the Narragansett turkey egg. The standard bronze turkey egg is also a good option yielding a strong bird. Poultry hatching is a serious business and cannot be taken lightly. There are basic procedures and timings, which a seasoned turkey hatchery service can guide you through. Turkey hatcheries recommend starting off by selecting an egg nest like the Rugg egg ranch. This is a nest for big birds and allows you to select from the options of 2, 4 or 6 cavities. It is available as a single nest with plastic padding. Apart from this there is an option for a rollout nest, which will contain 8 to 10 cavities. This fully assembled wooden nest features a rear end rollout. You will also need an egg basket, wooden nest eggs or perhaps ceramic nest eggs. Along with this it is a good idea to have a plastic egg brush on hand and a scale to weigh the eggs. The Cool Lite egg candler will let you view the eggs clearly as required. You can choose a brooder which uses radiant heat technology or the canopy gas option. 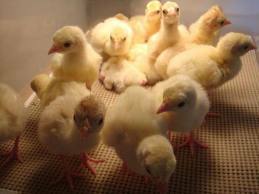 It is important to have a halogen brooder which can be either high or low. The poultry layer cage created out of PVC allows you to house the birds in comfort. A brooder thermometer and halogen replacement lamps should all be kept on hand for instant access and maintaining the temperature and heat required for hatching. Consider using high-tech waterers with heater bases that are freeze proof. The galvanized waterers are a great option as they last long and are wear resistant. For a lighter option you can also look at the polyethylene version. A plastic waterer is generally available in five or seven gallon sizes and allows you to turn a bucket into a waterer.